America's Health Insurance Plans (AHIP) is a national political advocacy and trade association with about 1,300 member companies that sell health insurance coverage to more than 200 million Americans. AHIP was formed through the merger of Health Insurance Association of America (HIAA) and American Association of Health Plans (AAHP). AAHP was formed through a merger between two health maintenance organization (HMO) trade associations, Group Health Association of America and American Managed Care and Review Association. AHIP is a member of CAQH, a coalition of healthcare trade associations and health plans that aims to simplify healthcare administration. The AHIP Center for Policy and Research is the trade association's research arm. 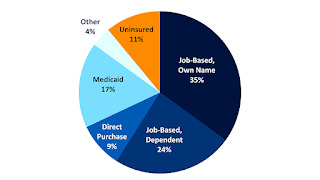 The center publishes research on a variety of forms of private health insurance, often based on survey data gathered from AHIP member companies. The forms of insurance studied include disability income and long-term care insurance as well as different types of medical expense insurance. Former AHIP President Karen M. Ignagni frequently served as a spokesperson for the views of the insurance industry. On September 27, 2007, she appeared on The Oprah Winfrey Show opposite Michael Moore, the director of Sicko, to discuss health insurance. On July 15, 2015 AHIP's Board of Directors unanimously elected Marilyn Tavenner as AHIP President and CEO. 1. Soaring health care costs due to fraud and waste. It admitted that lower spending typically did mean lower quality. It urged that a public-private Advisory Group should be tasked with the job of restraining and reducing wasteful and unnecessary spending, changing the rewards structure to favor quality and outcomes rather than volume of work, and streamline administrative processes across the health care system. 2. Reforms should strive for higher value and reduce disparities in ethnic and other minorities by focusing on keeping people healthy and intervening earlier, It called for coordinated care for chronic conditions, and the setting of uniform standards for quality, reporting, and information technology. Also there should be more investment in research to better understand which treatments and therapies work best for both the nation as a whole and for specific patients and accountability for consistently delivered, high-quality care based on the best evidence. It advocated a national initiative to increase public awareness of the links between preventable conditions and chronic illness, and prevention programs in our schools, worksites, and communities. 3. All Americans should have affordable, portable coverage and that there should be an individual mandate requiring all Americans to have adequate insurance as a quid pro quo for insurance companies issuing policies with no pre-existing condition exclusions. There should be better tax equity between company plans and private market policies, and tax credits on a sliding scale basis for those earning less than 400 percent of the Federal Poverty Level (FPL). Small businesses should get assistance through the tax code and other measures to make premiums stable and encourage them to contribute to their employees' health insurance needs. It promoted an "Essential Benefits Plan" available nationwide, that providing coverage for prevention and wellness as well as acute and chronic care, and that is not subject to varying and conflicting state benefit mandates. The large group market (covering 160 million Americans) should be preserved. The new system should avoid the cost shifting that was inherent in the old system. Public programs should be strengthened supported such as Community Health Centers, SCHIP and the reformed system should prevent so called "Medical bankruptcies". 4. Regulatory reform. It said that the patchwork of federal and state regulations often hinder, rather than helps, efforts to improve care and contain costs. It therefore said that the federal government should create a streamlined and effective regulatory system and the states should enforce it. It said the states should continue to run SCHIP and Medicaid programs and that eligibility for Medicaid should be simplified to those on 100 percent of the federal poverty level without other conditions. AHIP has spent more than $31.4 million on lobbying from 2005 to 2009, according to the non-partisan Center for Responsive Politics. This includes $3.9 million alone in 2009, which paid for the work of 50 lobbyists at eight different lobbying firms. "Debate the System, not the Anecdotes. Set the record straight then get off Moore's turf and on to ours." "Reframe the Debate: Mount Campaign against a Government-run Health Care system." "Define the Health Insurance as Part of the Solution." "Caution Democrats Against Aligning with Moore's Extremist Agenda." "Game Plan for Various Potential Scenarios." The AHIP memos do not list any factual errors in Sicko. The memos instead focus primarily on media messaging in terms of influencing politicians and public opinion. The group is now lead by Jenna Huisenga. AHIP's 2005 television ad "Shark Bait" drew harsh criticism for its claim that "lawsuit abuse" by American trial lawyers cost the typical American family $1,200 a year.